Louisville, KY (August 9, 2012) – With his clothes freshly pressed, a ready smile and a seemingly endless array of agricultural trivia at his giant fingertips, Freddy Farm Bureau is set to take a short leave from life on the farm and spend some quality time with the many visitors at the Kentucky State Fair in Louisville, August 16-26. This year will be Freddy Farm Bureau's 55th visit to the Kentucky State Fair. 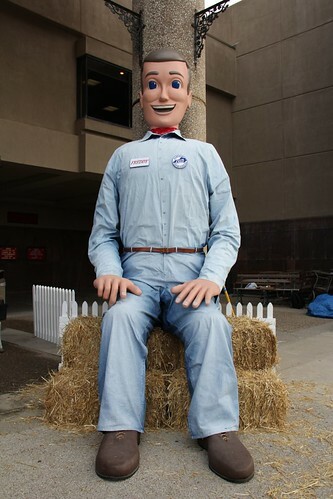 Freddy, seated comfortably on his hay bale on the front porch of Freedom Hall during the state fair, has become an icon at the annual event. This year will mark the 55th time that Freddy Farm Bureau has greeted fairgoers with his winning personality and uncanny ability to work the crowd with his family-friendly banter. He enjoys sharing his knowledge of Kentucky agriculture with his visitors, but Freddy also takes his role as the most-recognizable greeter at the state fair very seriously. Over the years, Freddy Farm Bureau has become an unofficial meeting place for many fairgoers, allowing him to talk with literally thousands of people as they wait by his hay bale for their friends and family to arrive. As even the casual passerby can imagine, it takes a big man to handle the duties given to Freddy. The good news for Kentucky Farm Bureau’s biggest member is that it seems like he was custom-made for telling Kentucky’s story of agriculture. Neither is Freddy alone in his duties – he represents more than 500,000 Farm Bureau member families in the state of Kentucky. Whether fairgoers are visiting Freddy Farm Bureau for the very first time or simply reminiscing about their childhood talks with the big man, they’ll want to save a few minutes of their state fair schedule to see him this year. He’s up and ready to talk each day of the Kentucky State Fair from 9am to 8pm. To further his ability to interact with fairgoers, Freddy Farm Bureau is now also active on Facebook and encouraging his many friends from around the state to “Like” his new page. He will be quite active on the page during this year’s state fair and even has an interactive contest hidden up his enormous sleeve for those that choose to follow his activity. Fairgoers can search for Freddy Farm Bureau on Facebook to participate in the social media fun.